As booksellers and collectors, we know and are frequently reminded of the fact that there's more to books than content. They have form as well, and sometimes this takes on an importance that far outweighs content. There may be no more inspired champion of the book's form than noted photographer Abelardo Morell. 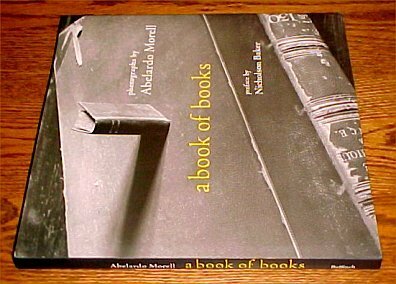 In a book of books, a collection of 52 duotone photographs of books, Morell comes to his subjects from viewing points perhaps many of us have never considered moving to ourselves, let alone shared observations from. Before we talk about what these photographs are, let's look at what they aren't. These aren't photographs of books made to look like something else; nor do they resemble what we've seen so much of in recent years, a kind of corrective, socially conscious photography that's been put on the public table and become our steady diet, at the base of which is a contempt for photography that tells lies. That Cosmo cover girl, for example, who exudes the bloom and vibrancy of youth, is, the argument goes, a fat lie. The truth? Why, it's a half-starved, hollow-eyed plain Jane transformed by a gifted makeup artist and a lying, thieving camera. Take a picture of (the real) her, and we've ascended to the high ground of - take a deep breath - art. The thing is, it isn't the picture that tells the truth at all - or lies. It's the vision that informs it. If so-called progressive photographers are producing material that deliberately confronts the entrenched dishonesty of, say, commercial magazine photography, it's important to recognize that their vision consists mainly if not entirely of the confrontation, a constricted perversion at best because it doesn't expand our awareness of the subject; it only brings us back to Earth with a dull thud. Contrast this to Morell's approach. He takes pictures of books as books - that is, at no time are we under the impression that we're looking at anything but books - but he also informs them with a vision that expands their truth to new levels. Example? 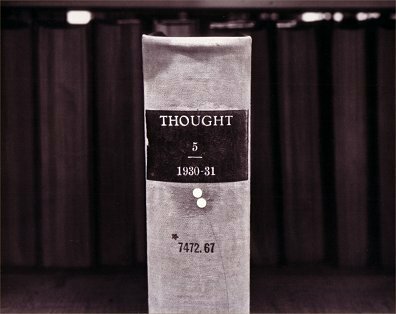 Consider this photograph on page 13: "Book of Proverbs for the Blind." This is a page from a book published in 1841, and though at first glance it appears to be Braille, it's in fact embossed words. Louis Braille had invented the Braille system some years in advance of this date, but there were fears that furnishing the blind with a language that was theirs and theirs alone would unnecessarily empower them with the means of communicating secretly - perhaps to the disadvantage of those with sight? As far-fetched and paranoid as this now seems, there remained a persistent attempt by some groups to force the blind to conform to a system of feeling actual words, a task that's exceedingly difficult to do with any efficiency. Since Braille's system was based on how our fingers actually feel, it ultimately prevailed, and so we are left with only a few of these historical but nonetheless interesting novelties. Our progressive photographer, in an attempt to tell the truth, might simply take a frontal, flood-lighted shot of this, something in line with what we might see if we opened the book on a brightly lit desk. This would not only be dull but also - and decidedly worse - not even approach replicating the experience that a blind reader might have had with this same page. 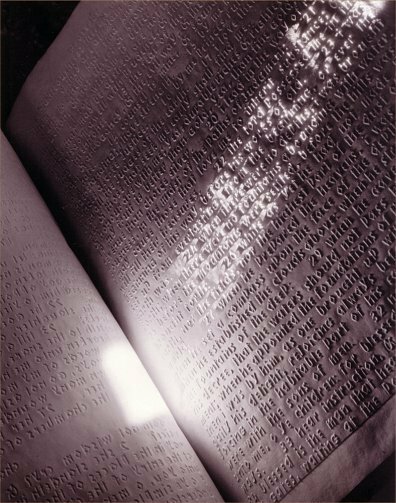 Morell, on the other hand, concentrates a beam of light at such an angle as to transform an otherwise uninteresting page into a shimmering yet shadowy landscape of hills and letter-shaped trees. Suddenly, instead of trying to read the words with our eyes, we might well feel the urge to touch them instead, precisely as a blind reader would. Many of us sighted readers, of course, have had the experience of seeing words figuratively leap from the page, and Morell's image might also suggest this. Both are expressions of truth in the truest sense of the word. Note that there's much darkness in the photograph as well, perhaps not unlike the almost overwhelming darkness that the blind inhabit day after day, relentlessly unceasing. Again, similarly, many of us have also experienced figurative flashes of insight while reading, and the dimmer band or path of light leading into the brilliant pool in the deep gutter of this book could be seen, metaphorically, as a gradually brightening understanding leading to an aha! moment - exactly as a blind reader (or we) might experience the impact of insight. No corrective photography is going on here. This is unbridled truth. There are 51 other truths in this book. (One of our favorites appears below.) Though coffee-tabled sized, this isn't a coffee table book in the isn't-it-pretty sense of the word, though it is a handsome volume; nor is it something to visit only on cleaning day with a dust rag or leaf through casually over drinks. Every photograph tells. Every photograph is a true experience for the reader who is receptive to it. Don't let the $42 list price scare you off. If you can afford it, this is one of those special books that don't often surface in this annoyingly derivative age we live in. It will, so to speak, stand without support on your shelves, strictly on its own merits, for years to come.